Peppers can be divided into two distinct groups: sweet peppers and chilli peppers. Sweet peppers (Capsicum) are popular large fruits in yellow, red and green that are widely used in salads and for baking. 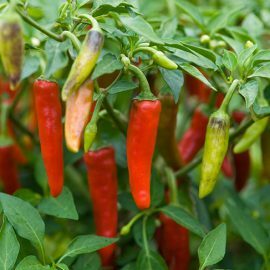 Chilli peppers are much smaller and hotter and are used for their spicy heat. As a general rule, the smaller and redder the pepper, the hotter it is. Seeds can be sown in pots of Gro-Sure Seed & Cutting Compost in the greenhouse or in a conservatory between February and April, as they should be kept between 18-25C (65-75F). Some varieties can be grown outside on a sunny patio, but most thrive in the warmer conditions provided by a greenhouse, conservatory or porch. Water well and feed regularly with a liquid feed, such as Gro-Sure Tomato Food. Fruits are ready for harvesting between July and September.